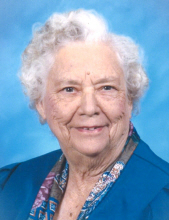 Martha Evelyn Rousseau Henderson passed from this life on January 29, 2019 in Haskell, Tx. She was 101 years, 9 months of age. Evelyn was born April 3, 1917 in Cooke County, Texas to Travis James Rousseau and Louise Pfaff Rousseau. She was the third of 10 children. The family moved to Haskell by train in 1923 when the land was mostly covered in tall prairie grass. Evelyn enjoyed playing baseball with neighborhood children. She was said to be a really fast runner. Even at an early age, Evelyn was a care giver for the younger children in her family. As the Great Depression settled on the area, the Rousseau children had to help support the family. Each Fall, Evelyn “pulled bolls” for local cotton farmers and had to miss the first few months of the school year. When the harvest was in, Evelyn rejoined her class and quickly brought up her grades. She later left school to work full time as a retail clerk for both Perry Brothers and Ben Franklin stores so that her younger siblings could stay in school until graduation. As her children grew older, Evelyn returned to full time employment at Perry Brothers as a retail clerk. In 1963, she began working for Jack and Jane McAdoo at Ben Franklin’s. Evelyn retired in 1980 in order to keep grandchildren. Evelyn was a talented seamstress. In sewing for her girls, Evelyn created many outfits including ballerina tutus and formal gowns. She even constructed a large sail for the boat Arthur built in the backyard. Evelyn had a “green thumb” and loved growing things. She often said gardening was her “therapy.” Evelyn grew a variety of beautiful flowers, particularly roses. Each year she had a vegetable garden, which always included plenty of hot pepper. The abundance was shared with others or canned. Her pickled beets and chow-chow recipes were family favorites. Birds were a source of enjoyment. Evelyn loved watching birds splash in the birdbath or build nests in the birdhouse. She had a large collection of bird figurines, and each had its special placement on her shelves. Evelyn truly doted on her grandchildren and great children. They each knew Granny would let them do pretty much whatever they wanted, as long as it was safe. Evelyn loved her Lord and Savior, Jesus Christ. She was a faithful member of East Side Baptist Church and the Gleaner Sunday School class. In earlier years, Evelyn taught the 4 and 5 year-old “Beginner” class in both Sunday School and Bible School. She also worked with the Sunbeams and GA’s. Infant son — Arthur Richard Henderson, Jr.
A service celebrating Evelyn’s life and legacy will be held Friday, February 1, 2019 at 2:00 P.M. at East Side Baptist Church in Haskell, Texas with Rev. Terry Bunch officiating, with burial following at Willow Cemetery. Services are under the direction of Haskell Funeral Home. A visitation is planned for Thursday, January 31, 2019 from 6:00-8:00 P.M. at Haskell Funeral Home, 2 Ave. D, Haskell, Texas. The family wishes to thank Dr. Wayne Cadenhead and Joe Yates, the staff at Haskell Healthcare Center, the staff of Haskell Memorial Hospital and Kindred Hospice for their loving care of Evelyn. To send flowers or a remembrance gift to the family of Martha Evelyn Henderson, please visit our Tribute Store. "Email Address" would like to share the life celebration of Martha Evelyn Henderson. Click on the "link" to go to share a favorite memory or leave a condolence message for the family.